The Battle of Velbazhd (Bulgarian: битка при Велбъжд, bitka pri Velbazhd; Serbian: Битка код Велбужда, bitka kod Velbužda) is a battle which took place between Bulgarian and Serbian armies on 28 July 1330, near the town of Velbazhd (present day Kyustendil). A detail from a 16th-century icon of Stefan Dečanski, depicting the Battle of Velbazhd. The growing power of the Serbian Kingdom from the late 13th century raised serious concerns in the traditional Balkan powers Bulgaria and Byzantine Empire which agreed for joint military actions against Serbia in 1327. Three years later the bulk of the Bulgarian and Serbian armies clashed at Velbazhd and the Bulgarians were caught by surprise. Serbian victory shaped the balance of power in Balkans in the next two decades. The Bulgarians did not lose territory after the battle but were unable to stop the Serbian advance towards Macedonia. Serbia managed to conquer Macedonia and parts of Thessaly and Epirus reaching its greatest territorial extent ever. Their new King Stefan Dušan was crowned Emperor with Bulgarian help in 1346. However, decades after Dušan's death in 1355 his Empire disintegrated as did Bulgaria after the death of Ivan Alexander in 1371 and both states were subsequently destroyed by the Ottoman Turks. During the long but unsuccessful reign of Emperor Constantine Tikh Asen (1257–1277) the Bulgarian Empire lost its possessions in northern Macedonia including Skopie, the original feudal estate of the Emperor to the Byzantines. Both Empires were faced with serious external and internal problems and from the 1280s the Serbs began to expand their Kingdom to the south in northern Macedonia. The situation in the Balkans and Asia Minor c. 1261. During the internal war in the Byzantine Empire (1320–1328) waged between the aged emperor Andronikos II Palaiologos and his ambitious grandson Andronikos III Palaiologos, the Serbian King Stefan Uroš III (also known as Stefan Dečanski) actively supported the side of old emperor and in the process gained some minor forts in Macedonia. After in 1328 Andronikos III won and deposed his grandfather. Serbia and the Byzantines entered a period of bad relations, closer to the state of undeclared war. On the other hand, the Bulgarian Emperor Michael Asen III supported his brother-in-law Andronikos III. Previously, in 1324, he divorced and ousted his wife and Stefan's sister Anna Neda, and married Andronikos III's sister Theodora. During that time the Serbs captured some important towns such as Prosek and Prilep and even besieged Ohrid (1329). The two Empires were seriously worried about the fast growth of Serbia and on 13 May 1327 settled a clearly anti-Serb peace treaty. After another meeting with Andronikos III in 1329, the rulers decided to invade their common enemy; Michael Asen III prepared for joint military operations against Serbia. Michael Shishman desired to retake the north-western and south-western Bulgarian lands which the Serbs had previously conquered. The plan included the thorough elimination of Serbia and its partition between Bulgaria and the Byzantine Empire. According to some Serbian chroniclers, he demanded the submission of the Serbian king and threatened to "set up his throne in the middle of the Serbian land". Both sides took careful preparations. Michael called in his ally Basarab of Wallachia who sent him a strong unit, as well as detachments of Ossetians/Jassiges and Tatars, a total of 3,000 men. Michael's army was estimated by contemporaries to be 15,000 strong. Stefan Uroš strengthened his army by more Catalan and German mercenaries (1,000 soldiers each), experienced warriors which presented an elite unit of Serbian army which comprised a total of 17,000 fighters. According to the plan the Bulgarians were to advance from the east and the Byzantines from the south and then to join forces somewhere in present-day north Macedonia but their coordination was feeble. In July 1330 Andronikos III invaded Macedonia but after he captured Prilep and five minor fortresses he halted his army and decided to await the outcome of the decisive battle between Bulgarians and Serbs. Serbian objective was to prevent the joining of the allies and to fight in separate battles. Fearing an attack on Morava valley by the way of Nish the Serbian King gathered his army in the field of Dobrich, on the confluence of the Toplica river into the Morava. A coin of Stefan Decanski. On 19 July the Bulgarian army led by the Emperor himself set off from the capital Tarnovo, marched through the Iskar Gorge and Sofia and entered the northern parts of the Struma valley. From there he continued towards Zemen and set his camp in the village of Shishkovtsi On the next day the army reached the important border castle near the modern village of Izvor [bg]. From there it was divided into two groups: the main forces under Michael Shishman through the northern parts of the Konyavska mountain (along the border between Bulgaria and Byzantine Empire) and headed towards the Zemen gorge. The smaller part which included the army support went through an easier but longer road through the mountain and arrived between the villages of Konyavo and Dvorishte. Other Bulgarian forces under the command of the Emperor's brother Belaur set off from his seat in Vidin but did not participate in the battle which was among the main reasons for the following defeat. According to some historians they were stationed as a reserve around the Izvor castle while others think that he arrived too late. From his camp on the confluence between the Toplica and the Morava rivers Stefan Decanski expected an attack from Vidin to the north-east. His purpose was to hinder a Bulgarian advance to the interior of his state. Upon the news for the Bulgarian presence in the Struma valley the king marched southwards along the Bulgarian Morava and then the valley of the river Pchinya until he reached the Staro Nagorichino village where stopped for a pray in a nearby monastery. After that he continued to the Ioakim Osogovski Monastery where he prayed again and advanced on Bulgarian territory near the Kamenitsa river in the vicinity of Velbazhd where his army encamped. The Serbian army attended holy liturgy in the church of Saint George in Staro Nagoričane, prior to the battle. The Serbian king buried the deceased Bulgarian emperor in crypt of the church after he was slain in the battle. The bulk of the two armies camped in the vicinity of Velbazhd but both Michael Shishman and Stefan Decanski expected reinforcements and from 24 July they began negotiations which ended with one-day truce. According to some historians there was a minor clash between the armies near the village of Kopilovtsi in which the Serbs were repulsed and showed their King that his forces were not enough to achieve success. The Emperor had other problems which influenced his decision for the truce: the army supply units had not yet arrived and the Bulgarians were in shortage of food. Their troops scattered around the country and the nearby villages to search for provisions. Meanwhile, receiving a sizable reinforcement led by his son Stefan Dušan during the night (including foreign mercenaries) attacked early on 28 July 1330 and caught the Bulgarian army by surprise. One Serbian unit under the command of Decanski took the Spasovitsa heights while more Serbian troops including 1,000 heavily armoured Catalan mercenaries led by Stefan Dusan penetrated the valley of the Dragovishtitsa river toward the village of Shishkovtsi. The main battle took place between the village and the Spasovitsa heights in a locality called Bozhuritsa. Although caught by total surprise Michael Shishman attempted to bring his army to order but it was too late and the outnumbered Bulgarian units were crushed. The battle was bloody because the remaining Bulgarian forces on the battlefield stiffly resisted and according to some chroniclers the river reddened. Both sides suffered heavy casualties and the Bulgarian camp was looted by the Serbs. The Emperor himself was badly wounded, his horse killed under him and was captured by the coming enemy soldiers. He was taken to the Serbian camp where he probably expired from his wounds on the fourth day of his captivity, on 31 July. Some other theories suggest that he perished on the battlefield or was killed by order of Stefan Dusan. The body of the ill-fated Emperor Michael was brought to King Stefan and was consequently buried in the monastery of Staro Nagoričane (village Staro Nagoričane, near Kumanovo). On the place where he spent his last night praying in his tent, Stefan built a church (still existent to this day). On the second day after the battle (30 July) the Serbs advanced towards the Konyavska mountain but it was impossible for them to achieve any success because more Bulgarian troops under Michael's brother Belaur and the governor of Lovech Ivan Alexander were concentrated around the Izvor castle and blocked the way to the interior of the country. Near Izvor Belaur met King Stefan Decanski and they concluded a peace. The Bulgarians agreed to accept as their ruler the underage Ivan Stefan, the son of Michael Shishman and Stefan's sister Anna Neda. There were minor territorial changes along the current border of the two states but after the battle Bulgaria could not prevent the Serbian invasion of Macedonia. 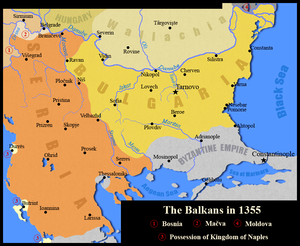 Map of the Balkans in 1355. Serbia had reached its greatest expansion ever following the battle of Velbazhd. Hearing the news of his ally's death, Andronikos decided to abandon the war with Serbia and headed to take advantage of the Bulgarian weakness. However, in 1332 the Bulgarians defeated the Byzantines in the battle of Rusokastro and regained many territories in Thrace. King Stefan reached Macedonia and regained the towns that were taken by Byzantines at the beginning of the campaign. After a successful end of the war Stefan returned to building the Visoki Dečani monastery, his grand edifice in the region of Metohija, which he bestowed with many villages in a charter issued at the end of the year. In the beginning of the year 1331 young king Stefan Dušan rebelled after his father, possibly on the course of further actions against the Byzantine Empire. In stark contrast with his pious father, juvenile Dušan was aggressive and was supported by those Serbian nobles who desired wider exploits of the victory by Velebuzhd. During the rebellion (January to April), Bulgarian nobles dethroned Ivan Stefan and brought to rule Ivan Alexander (1331–1371) cousin of Michael. In the long run Velbuzhd opened a period of around 20 years in which Serbia rose to be the strongest state in South-Eastern Europe. When Dushan succeeded in taking over of the throne later in 1331 he launched attacks on Byzantine possessions, securing northern Macedonia in 1333–1334. Later, he exploited the Byzantine civil war of 1341–1347 to expand his control over all of Macedonia, Albania, Epirus, and Thessaly. Bulgaria and Serbia kept friendly relations and in 1346 Stefan Dusan was crowned Emperor with the help of Ivan Alexander, founding the Serbian Empire. The battle is believed to be depicted in traditional Serbian epic poetry, in the Gusle song Ban Milutin and Duka Hercegovac. ^ a b c Nic. Gregoras. I, р. 455. 7-9. ^ Ćirković 2004, pp. 62. ^ Lawler, Jennifer (2011). Encyclopedia of the Byzantine Empire. McFarland. p. 299. ^ Ioannis Cantacuzeni ex-imperatoris historiarum libri IV. Ed. L. Schopen, I-III.Bonnae, 1828, I, 428. 23 – 429. ^ Cantacuzenos, I, 428. 9-23; Nic. Gregoras. I, р. 455. 18-21. ^ Nic. Gregoras. I, р. 454. 21-24. ^ Димитров. Македония, с. 134. ^ Политическа география, II, цит. м.; История на България, III, цит.м. (В. Гюзелев). Wikimedia Commons has media related to Battle of Velbazhd.